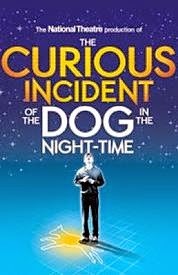 Nominated for six 2015 Tony Awards including Best Play of the Year is The Curious Incident of the Dog in the Night Time. The show which first premiered in the West End in August 2012 opened at the Ethel Barrymore Theatre last fall to rave reviews from critic's and audiences alike. I had the pleasure of seeing the show shortly before it's Broadway debut and was blown away. At first I had considered reading the book prior to seeing it but changed my mind as I wanted to go in with a clear mind and no expectations. I'm glad I did. Of course now I'm dying to read the book. Oh well. I'm sure I'll get around to it eventually. I just hope I enjoy it as half as much as I enjoyed the show. Having lived in New York for over twenty-three years now I have seen hundreds of shows. Now to be honest when I first moved here musicals were more my thing. However in the last eight or nine years new plays have been the thing that I have been most excited to see. Which is why I was so eager to see this one. It is truly one of the most exciting nights that I have ever had in the theatre. In the past moments like those were reserved for some of my favorite musicals like Rent or Miss Saigon. Now I can add a new one to the list. Now as I said The Curious Incident of the Dog in the Night Time is based on a book. A very popular book I might add as it has sold over two million copies since it was first published in 2003. So now that you know that the show is based on a best selling novel and is now a Tony nominated play I bet you are ready to purchase tickets right? Well just in case you still aren't sure here is a little synopsis about the show for you to check out. Enjoy! Fifteen-year old Christopher has an extraordinary brain; he is exceptionally intelligent but ill-equipped to interpret everyday life. When he falls under suspicion for killing his neighbor's dog, he sets out to identify the true culprit, which leads to an earth-shattering discovery and a journey that will change his life forever. O.K. I know it sounds a little heavy but trust me folks. It is a must see. I mean a show doesn't get all those Tony nominations for nothing after all. By the way for those of you who want to see the show you are in luck. We sell it. In fact we sell all of this year's Tony nominated shows. Get your tickets to see The Curious Incident of the Dog in the Night Time on Broadway at the Ethel Barrymore Theatre. It is theatre at it's finest. Until next time theatre fans.